When I added GlaxoSmithKline to my portfolio in early 2015, the company was heading for trouble. Some of its key blockbuster drugs (such as Advair, which generated almost a quarter of the company’s revenues) were going off-patent, which meant the easy profits Glaxo had relied on for years were about to vanish. In order to offset those lost profits, Glaxo was going to have to invest massively into additional research and development (R&D), with the aim of producing new drugs and medicines which, once patented, would provide new revenue streams and fat profit margins. In total, Glaxo was going to have to replace something like half its revenues over the next decade. There was, and still is, much uncertainty around whether or not this is actually possible. None of this sounds particularly enticing, but this is exactly the sort of situation which can produce heavily discounted valuations. In this case the discount resulted in a dividend yield of almost 6% from a company with a long record of dividend growth. Today, Glaxo’s future seems as uncertain as ever, with management now pinning their hopes on a separation of the company’s pharmaceutical and consumer healthcare businesses. In addition to this uncertainty, the recent market decline means there are more attractive fish in the sea, so I have decided sell. In the years leading up to 2015, Glaxo had generated a long series of growing dividend payments, backed by steadily rising revenues and earnings per share. Its ten-year growth rate across revenues, earnings and dividends was a reasonable 3.5% per year, while its average return on capital employed was an impressive 19%. This was clearly a very successful company, although thanks to excessive investor optimism in earlier years, its share price had remained largely unchanged since 1998. In January 2015 I added Glaxo to the model portfolio and my personal portfolio. My assumption (or hope) was that the company would invest more heavily in R&D in order to increase the size of its drug pipeline and therefore, eventually, replace products like Advair which had expiring patents. I thought this process would take several years at the very least, which was fine by me as I prefer to hold companies for years rather than months. I also thought the dividend would probably be maintained during this period because the company didn’t have a huge amount of debt. With hindsight though, it did have enough debt so that taking on even more debt to fund additional R&D wasn’t a sensible option. In terms of risk, Glaxo’s need for ‘big wins’ (i.e., coming up with new patentable drugs which can be sold on a massive scale) meant there was more uncertainty than I’d ideally like. Yes, Glaxo has come up with many blockbuster drugs in the past, but that doesn’t mean it will do so in the future. In contrast, Domino’s Pizza (which I also own) can expand by opening dozens of essentially identical restaurants producing thousands of essentially identical pizzas. Which do you think is easier; curing cancer or making yet another pineapple pizza? Makes it harder for investors to see which parts of the business are performing well and which are underperforming. Makes it easier for management to use excess cash generated by one business to prop up another less successful business unit. Allows management to buy and sell business units, which makes it harder to track the company’s underlying performance over a number of years. Each year since then has involved some degree of “radical transformation” in order to reduce risk and improve returns, and 2014 (the current financial year at the time of purchase) was no different. To sell Glaxo’s oncology business to Novartis for around £16 billion. The idea was to increase the scale of and weighting towards Glaxo’s consumer healthcare and vaccine businesses, as part of the larger strategy of increasing diversity and moving away from western markets and pharmaceuticals. In that respect the deal seems to have worked. In 2015, Glaxo focused on integrating the new consumer healthcare and vaccine businesses, as well as simplifying and restructuring the pharmaceuticals business as part of a drive to reduce costs by £3 billion before the end of 2017. It was clear that trimming any operational fat was going to be a key component in its attempt to offset declining revenues from its previous biggest seller, the now off-patent Advair. The current level of annual dividend of 80 pence exceeds the cash flows from our businesses. However, the Board has said it expects to maintain that level of payment for 2016 and 2017, which are important years of change. During this period, the long-term impact on cash flow of the decline in Seretide/Advair should become clearer but so should the benefit to cash generation of the growth of recently launched products, the expansion of our Vaccines and Consumer businesses and reduced restructuring expenditure. In other words, the period of change and transformation would continue for another few years, which meant that uncertainty would remain high. 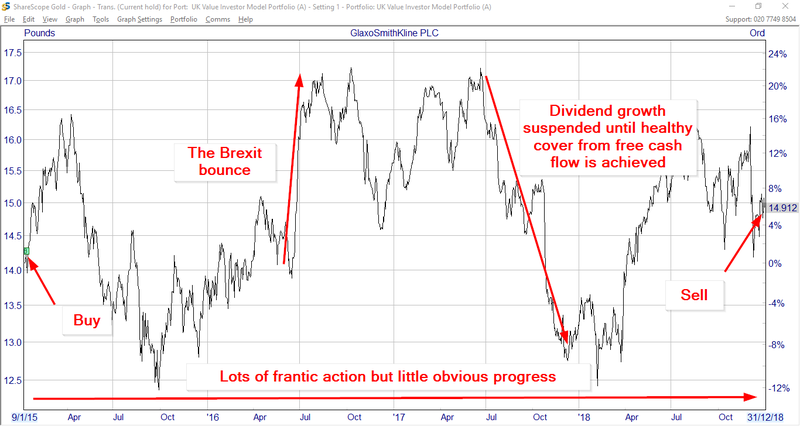 Management were effectively crossing their fingers, hoping that the 80p dividend would prove to be sustainable once the dust had finally settled (assuming it was ever going to settle). In the end, 2016 and 2017 turned out to be relatively good for Glaxo, with revenues finally breaking the £30 billion barrier. More importantly, free cash flows began to recover as the cost of restructuring and integrating the Novartis deal faded away. The Advair patent cliff was far from over, but with sales from new respiratory products more than offsetting Advair’s decline, there was at least a glimmer of light at the end of the tunnel. Our 2017 results reflect a continued focus on execution including driving growth from existing products and recent launches; controlling costs tightly to help build better operating leverage across the Group, while also investing behind our future growth drivers; and improving cash generation to increase our capacity to support both investment and the dividends we pay to our shareholders. The Board intends to maintain the dividend for 2018 at the current level of 80p per share, subject to any material change in the external environment or performance expectations. Over time, as free cash flow strengthens, we intend to build free cash flow cover of the annual dividend to a target range of 1.25-1.50x, before returning the dividend to growth. Overall, I think Glaxo has performed well in the face of significant headwinds; not least of which was and is the loss of revenues from Advair. So if things are going so well, with perhaps a glimmer of light at the end of the tunnel, why have I decided to sell? There are several reasons. First, while there may be light at the end of the tunnel, the hard truth is that Glaxo hasn’t significantly grown in more than a decade. There are lots of reasons why, but none of them is a one-off freak event. Pricing pressure from buyers, competitive pressure from peers and the loss of patents on key drugs are all factors that are likely to be repeat in the 2020s. Holding onto a company where there is a significant chance of zero or low single digit growth for another decade is not something I’m keen on. Second, Glaxo’s share price has stood up well in 2018 while much of the UK market has collapsed, or at least declined significantly. This broad decline in share prices makes many other companies look more attractive than they did six months ago. If Glaxo’s price had also declined I might have held on, but it hasn’t. Finally, Glaxo’s transformation is still far from complete, with management recently announcing a proposed demerger of the company’s consumer healthcare and pharmaceutical businesses. This is what many investors (notably Neil Woodford) have been asking for in recent years, and I think it’s probably a good idea. However, it does mean yet another major change to the composition of the company and the loss of what I think is the best part of the company, i.e. its consumer healthcare business. This combination of low growth, robust price and significant ongoing change and uncertainty is why I decided to remove Glaxo from the model portfolio and my personal portfolio. The investment’s annualised total return of 7% per year is acceptable, but not very satisfying. My intention is to reinvest the proceeds into a company which is simpler, more focused, less likely to be endlessly ‘transformed’ and where the combination of dividend yield and dividend growth are more likely (hopefully) to produce double digit annual returns. Looks like a good move John, it could turn out to be a basket case after the recent proposed acquisition of Tesaro at a premium price of $5.1bn and which itself has an uncertain future due to heavy competition. Sold this for 1722 in Jun 2017. Astra went for similar reasons. Careful with Domino, it might well do fine, but it’s in the process of canabilisation with split territories, perhaps leading to saturation? As for Domino’s, like all single country retailers it will reach saturation at some point if it keeps growing, after which growth in the UK will be limited to population growth, price hikes and changing consumer tastes. But it does have an international business too, which can hopefully keep its growth rate in double digit territory for a good few years yet. But, as always, we will have to wait and see. Wise to sell GSK. I am surprised you didn’t follow Neil Woodford earlier. His reasons for selling have been seen by some as ironic given the demerger announcement but the way it is being managed and the general lack of clear vision or strategy will vindicate him in the long run. Emma Walmsley this will be the end of this once great company. Hi Duncan, when Woodford sold I was hoping to hold on to see how things panned out, but the recent decision to split the company (which I think is a good idea) just takes the uncertainty to another level. At some point the uncertainty is so high that the outcome is more down to change than anything else, and I’m not interested in that, especially give the robust valuation, so for me selling makes the most sense. Duncan, My feeling, rightly or wrongly, is that it’s probably not wise to take heed of any of Neil Woodford’s investment decisions. Many of them over the last 3 years have been loss making, unlisted companies with dubious prospects, highly indebted companies or high risk biotech companies. Sounds harsh I know but for a product that markets itself under the banner of equity income, it seems like a breach of the trades description act to load the funds with non income bearing, non listed companies. At one point over 20% of the original fund consisted of unlisted securities out of well over 110 share holdings. Much of the revaluation of the Net Assets (used for measuring the fees paid) is based on making additional rounds of investments in private companies, which means using a new valuation of the existing investment with the new round price. This is a dubious practice as the companies are not liquid, or tradeable for the fund holder. Hi Andreas, thanks; clarity is something I always strive for. As for replacing GSK, there are lots of candidates (although it depends on what you want from an investment), but like you I’m also out of pharma for now.